The Home Mini will be Google's competitor to Amazon's Echo Dot, serving as a cheaper alternative to the Google Home. It is expected to be priced at $49 and will go on sale from October 19. Google is set to announce a bunch of new hardware devices at its event in few hours. The search giant is anticipated to introduce the Pixel 2, Pixel 2 XL, refreshed Daydream View headset, Google Home Mini speaker and a high-end Pixelbook running Chrome OS. The details of these devices have already leaked and now Google Home Mini has appeared on Walmart's pre-order page. The Home Mini will be Google's competitor to Amazon's Echo Dot, serving as a cheaper alternative to the Google Home. Droid Life first spotted the listing and it confirms the name and $49 pricing for the Google Assistant based smart speaker. The now pulled listing reveals that the device offers the same features like Google Home but in a smaller form factor. It also reveals that the device is codenamed "Joplin" and weighs less than 500 grams. The Home Mini measures 4.53 x 4.53 x 4.72 inches in dimension. 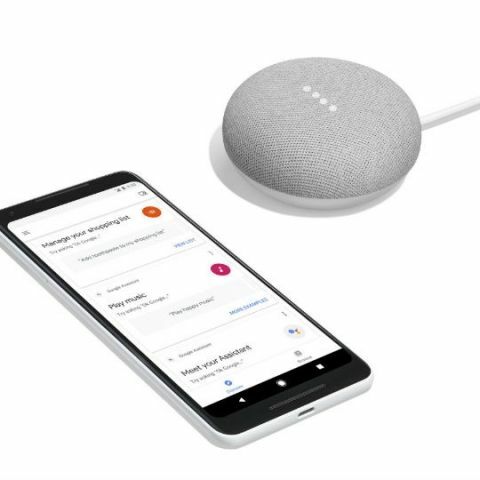 Walmart's listing page suggests that the Google Home Mini will be available on October 19, the same day when the Pixel 2 is said to become available for retail. Walmart is also planning to offer a discount of $25 with Google Express, bringing the effective price down to $24 on all items ordered with the service through January 15. The listing by Walmart also shows the upcoming Pixel 2 XL from a different angle. The image posted by 9to5Google shows Pixel 2 XL's screen turned ON and the Google Home app for accessing the new smart speaker. The model seems to be the white variant with black bezels on top and front-facing speaker setup. The Pixel 2 and Pixel 2 XL is said to hit retail stores at a starting price of $649 and $849 respectively. what is about redmi note 4 pre order ? which is the best under 43000 rs Google pixel Xl 128 GB or Oneplus 5T 128 GB?? Bose Soundlink mini 2 OR Sony SRS-X55?